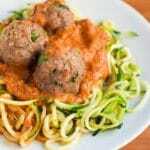 Zoodles with turkey meatballs in a creamy roasted red pepper sauce is light, healthy and so delicious! Gluten-free and dairy-free, this meal is even great for a Whole 30 diet! The turkey meatballs are full of garlic and spinach, which is balanced so well by the creamy red pepper sauce. I’ve hopped aboard the zoodle train! Choo Choo! Let’s be real, are we going to fool anyone into thinking we are actually eating pasta? That’s a big NO. But! Does it still satisfy a hankering for pasta since we can twirl it around our forks and smother it in delicious roasted red pepper sauce? Yes! Indeed it does! I just received a vegetable spiralizer for Christmas and I could not be more in love. From zucchini to beets to sweet potatoes, I can spiralize ANYTHING! Zucchini seemed like a safe first attempt at spiralizing veggies and now I’ve gone crazy for them! For someone who doesn’t eat a whole lot of gluten-free pasta, vegetable noodles are kind of awesome. Because while they look like pasta, they aren’t trying to BE pasta. Sorry to the gluten-free pastas out there.. until someone finds me an awesome gluten-free brand to make me feel differently. This zoodle with turkey meatballs in a roasted red pepper sauce recipe is seriously my new favorite meal. It’s gluten-free and dairy-free, of course, but also great for the Whole 30 diet (and probably paleo but I’m not as with it on those requirements). The turkey spinach meatballs are moist, even without the addition of any eggs or breadcrumbs. I literally was eating them off the pan while I was trying to take pictures of them. The roasted red pepper sauce is also amazing – it’s simple, light, and indulgent all at the same time if that’s even possible. I just roasted some red bell peppers in the oven while I was prepping my meatballs, then I threw it in a food processor with some garlic, onions, almond milk, spices and oil. Easy squeezey, roasted bell pepper peasy. That’s how that saying goes right? When you combine the zoodles, roasted red bell pepper sauce and turkey meatballs together it’s just pure MAGIC and a healthy dinner too! Next up on the spiralizing to-do list, SWEET POTATO NOODLES! Get ready friends! On a baking sheet, toss red bell peppers and 1 tablespoon of oil together and lay in a single layer. Roast for 25-30 minutes, until the bell peppers are tender and there are some black char marks. In the meantime, start making your turkey meatballs. In a large bowl combine ground turkey, spinach, coconut flour, salt, thyme, oregano, garlic, 1 tablespoon of oil and black pepper. Mix until combined well. Roll into small meatballs - you'll get about 15 out of a batch. Line a baking sheet with foil and place meatballs on the sheet. Bake for 12-15 minutes, until baked through. While the meatballs are cooking, in a small skillet, combine 1/4 cup diced onion and 1 clove of garlic in 1 tbsp of oil. Saute for 5 minutes until soft and fragrant. Add to a food processor with the bell pepper when it's ready. Then also add almond milk, oregano, thyme, rosemary, salt, black pepper, 2 tbsp of avocado oil or olive oil. Process until combined and smooth. Use a vegetable spiralizer to turn the zucchini into noodles. In a skillet (can be the same one we used before), add the zucchini with the oil and saute for 2-3 minutes. Sprinkle with salt and pepper. To assemble, top the zucchini with the roasted red pepper sauce and 3-4 meatballs. This sounds yummy I totally need to give Zoodles a try! Yum! I need to buy a spiralizer, that’s it! This looks delicious! And I love that little gif at the end! Omg this was AMAZING!!! The sauce alone is incredible. Love that you add more spices to make it your own Samantha! I don’t put the nutritional info on any of my recipes.. but you can use a site like My Fitness Pal and add the link to this recipe on the site and it will give you all the nutritional info! Hope this helps! How can I make the sauce a tad sweeter? Tastes a little bland to me. Hi Katie, I find that the garlic and spices in the recipe should add enough flavor, as does roasting the peppers. I would first try adding more garlic if you would like even more flavor in the sauce. However, if you would like to make a sweeter sauce, you can always add sugar, honey or brown sugar to the recipe. Hope this helps! Is the packed spinach the defrosted frozen kind? Or is it fresh chopped? Also, are the spices fresh or dried? Thanks!! Will the meatballs hold up if made in advance the day before the were cooked/ate? I would like to be able to prep them the night before, after the kids are in bed. Hi Tara! Yes! You can definitely prep them the night before and just keep them covered in the refrigerator. We also tend to cook a bunch on Sundays and eat them throughout the week for lunch and dinner – so that’s another option Enjoy! Do you happen to know about how many calories/nutritional info for one serving? Hi Robin! I just updated the recipe to include nutritional information. It may vary a little depending on the brands of products you use. Hope this helps! Hi – would it be OK to use almond flour instead of coconut? Would the amount of oil need to be adjusted? Thanks! Hi Ashleigh! Almond flour will work just fine. You shouldn’t need to adjust the amount of oil in the meatball but if for some reason it isn’t moist enough, just add about 1/2 tbsp. Hope this helps! Thanks so much for the fast reply! I read online that coconut flour absorbs more moisture, so almond flour requires less – but that was specifically for baked goods, so I had a feeling it wouldn’t apply here 🙂 I can’t wait to make this. Thanks again! wow!!! this turned out amazing!!! definitely adding it to my list! i added a jalepeno as well with the peppers and added some hot paprika so it got a bit spicier!